Ten minutes after the final whistle, some of the more-experienced Ayr players still lingered on the Millbrae touchline, loath to leave the scene of this magnificent victory. As the press corps passed, one battle-hardened forward winked and said: “Who wants to retire after a semi-final anyway”. 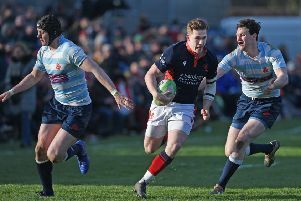 Heriot’s, who will travel to Millbrae on Saturday 23 April to defend their BT Premiership crown against the team who have been the best this season so far, should tak tent: some at Ayr will be playing their final game that day – they intend going out as winners. Ayr fielded virtually the same XV as last week, only D’arcy Rae, on Pro12 duty with Warriors in Italy, was missing. The bodies were the same, the mind-set was totally different. Where Ayr had been nervous and unsure in the BT Cup semi-final, here they were confident and pro-active. Calming Melrose’s early fury, Ayr, on the back of a massive forward effort, were dominant. Two things helped the turnaround – they were the more-disciplined team and they didn’t make the sloppy errors. Instead, it was Melrose who kept racking up the penalties and dropping easy balls. Nobody in pink and black did more than stand-off Frazier Climo. The man from Taranaki scored a great solo try, converted four of Ayr’s five tries and punished Melrose indiscretions with five penalty goals. Melrose controlled the early exchanges but fell behind to Rob McAlpine’s 14th-minute try, which came from sustained forward pressure. Climo then eased Ayr away with two penalty goals before, in the 35th minute, charging down Nyle Godsmark’s attempted clearance, hacking on and just beating the covering Bruce Colvine in a race to the loose ball. He then completed the first-half scoring with his third penalty from the final kick of the half. Richard Mill replaced Godsmark at half-time and two minutes into the second-half, he opened the Rose account with a penalty goal, but the hope this had given the visitors evaporated three minutes later with Will Bordill’s try, the flanker charging over off a short-range line-out move, Climo converting. The game, however, finally went away from the Borderers in a two-minute spell in mid-half. Climo goaled his fourth penalty then, almost from the restart, Scott Sutherland’s soaring line-out take was flicked down to scrum-half David Armstrong, whose break led to Peter McCallum touching down behind the posts. Climo added the extra and Ayr were in easy street at 38-3. But they went down fighting. A fierce spell of pressure saw replacement Ruaridh Knott charging over, with Joe Helps converting. But Ayr responded with another blow, as another penalty offence was punished by Climo, before, five minutes from time, a Melrose pass was plucked out of the air on the home 22 by Ayr skipper Ross Curle, who set off for the distant try line.